Pedestrians leave and enter the London Stock Exchange in London, Britain August 15, 2017. 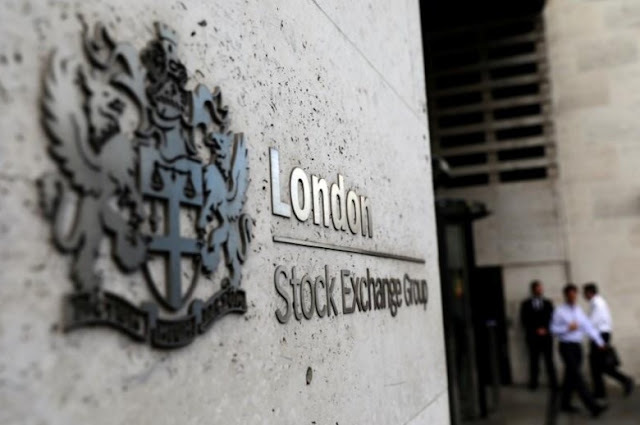 LONDON - The euro tumbled and European stocks scored their biggest gains in over six weeks on Thursday, as the European Central Bank proceeded with caution on its biggest step yet in unwinding years of loose monetary policy. The euro skidded almost a full cent towards $1.17 after the ECB said it was halving its stimulus to 30 billion euros ($35.17 billion) a month, but that any rise in interest rates remained off in the future. Moves were compounded by reports that Janet Yellen was no longer in the running for an extension to her term as chair of the Federal Reserve and as Wall Street opened higher before earnings from tech giants Google, Amazon, Microsoft and Intel. The Dow was flirting with another record high, the S&P 500 gained 6.78 points, or 0.26 percent, while the Nasdaq was barely budged at 6,567.42 points. Europe’s main stock exchanges saw their strongest day in more than six weeks. Markets such as Italy, Spain and France rose more than 1 percent on a sliding euro and debt market borrowing costs. As well as treading carefully with its stimulus cut, the ECB also took a leaf out of the Fed’s book by promising to keep re-investing the proceeds from the 2.4 trillion euros worth of bonds it has been buying since early 2015. In a pre-ECB appetizer, Sweden and Norway’s central banks both kept interest rates on hold. Their currencies barely budged, though, as focus remained on the ECB and the euro zone. European bonds rallied, after selling off along with other fixed-income markets over the past week. The yield on Germany’s 10-year government bond was down 4 basis points on the day at 0.44 percent. Thirty-year Italian yields hit their lowest in a month. U.S. Treasury yields fell from their seven-month high of 2.4750 percent overnight. Elsewhere, Britain’s sterling built on strong gross domestic product data to hit a nine-day high before the dollar rebounded. South Africa's rand was the day's big mover. It dropped 1 percent after Wednesday's budget slashed growth forecasts, raised debt projections and re-ignited fears for its credit rating. That left the currency down almost 4 percent and heading for its worst week since the sacking of a finance minister in March. The Canadian dollar also saw a major shift. It was at a three-month low of C$1.2811 per dollar after the Bank of Canada sounded more cautious in its policy statement on Wednesday. Emerging markets were feeling the heat of the dollar’s rise [EMRG/FRX], while oil also slipped following an unexpected increase in U.S. crude inventories and high U.S. production and exports. Gold also slipped as the dollar gained. But the main metal market mover was aluminum CMAL3, which surged to $2,215 a tonne, the highest since March 2012, as expectations grew that growing demand and cuts to output from China would squeeze supply [MET/L]. “New price support has emerged in the form of cost inflation,” analysts at Standard Chartered said. The euro tumbled and European stocks scored their biggest gains in over six weeks on Thursday, as the European Central Bank proceeded with caution on its biggest step yet in unwinding years of loose monetary policy. The euro skidded almost a full cent towards $1.17 after the ECB said it was halving its stimulus to 30 billion euros ($35.17 billion) a month, but that any rise in interest rates remained off in the future.